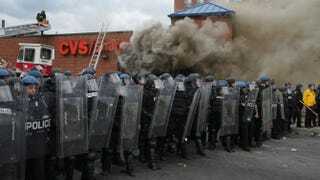 Baltimore police form a perimeter around a CVS pharmacy that was looted and burned during violent protests following the funeral of Freddie Gray April 27, 2015, in Baltimore. On Wednesday, Baltimore’s Fraternal Order of Police released its “after action” review regarding the Baltimore uprisings in April in the wake of the death of Freddie Gray while in police custody. The report’s overview states that “the rioting resulted in millions of dollars in property damages and injuries to citizens,” and that reportedly more than 200 police officers from the area who responded were injured. According to the report, viewed by the Baltimore Sun, local Baltimore officers complained that they were not properly trained for the April 27 demonstrations. Union officials also claimed that officers were ordered not to intervene. “Officers reported that they had suffered injuries from the lack of protective riot equipment and the constraints placed on them by commanding officers,” the union’s review reads. According to officers’ statements, they were ordered not to wear protective gear during the protest. “Proper equipment is vital to the health and safety of officers at all times; however, protective gear during riots is imperative,” the review reads. “Our hope was that this report would shed some additional light on how we can better prepare our officers should there be future unrest,” Rawlings-Blake said. Shortly after the report was released, Rawlings-Blake issued a statement that Batts had been fired and that Deputy Police Commissioner Kevin Davis would be the interim commissioner effective immediately.